Fight for Riches Beyond Your Wildest Dreams! Inside the Cave Troll's lair you'll find countless magical artifacts and ferocious monsters, along with plenty of other treasure hunters willing to do anything to claim all the riches for themselves. 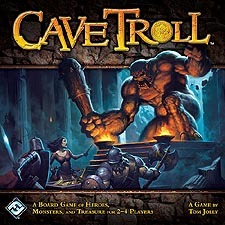 Cave Troll is a competitive strategy game of manoeuvring, fighting, and looting for 2 to 4 players. Each player commands a party of heroes striving to amass as much wealth as they possibly can before time runs out. To thwart your opponents, you can wield powerful artifacts and summon deadly minions to stand in their way - including the terrifying Cave Troll itself! The player who dominates the Cave Troll's lair and gains the most gold wins.